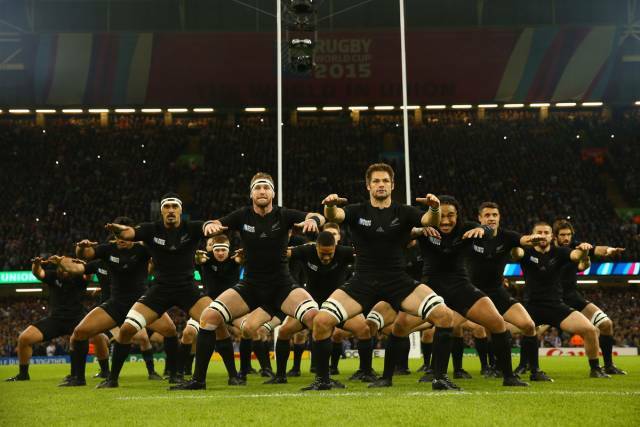 Stand-up comedian, Andy Zaltzman, reflects on the Rugby World Cup Final. A Rugby World Cup Final for the Purists? The 2015 Rugby World Cup final was, unquestionably, ‘one for the purists’. This curious phrase, for reasons which elude me, is generally applied in the realm of sports to a contest of mind-numbing, grinding tedium, as if only a superior plane of expertise and an innate knowledge of a labyrinthine law-book can truly allow proper appreciation of the well-hidden beauty of the patently awful. Last Saturday, New Zealand and Australia gave the watching rugby world a final which was, objectively, one for the purists. And one for the novice rugby-watcher, the casual fan, the lifelong obsessive who just loves watching big people run around and smash into each other, the traffic warden wandering past a TV shop, the unborn child listening intently to the excited bark of the radio, the ardent New Zealander who literally bleeds rugby balls (a common diet-related issue in that part of the world), the mystified Venezuelan, the long-dead early rugby legends tuning in via the latest Ouija app, and even, perhaps, the dyed-in-the-heart rugby league fan. Too many rugby balls in the diet? Previous Rugby World Cup finals have mostly offered volcanic intensity, tension that could be felt on Mars, some kicking, some more kicking, and enough risk and adventure to fill a yoghurt pot. They have been rather like watching two rhinoceroses racing to give birth to a baby triceratops. Gripping, tense, exciting in their own distinctive way, tinged with a sense of history in the making. But somewhat lacking in expansive, vibrant movement. A compilation of Great Rugby World Cup Final Tries 1987-2011 would have been very short indeed. In fact, in the build-up to the final, World Rugby did indeed post a short compilation video whose blurb claimed that it contained “11 of the greatest ever Rugby World Cup final tries”. After what we can assume was an exhaustive and often fractious discussion by a specially-convened elite judging panel, zero insufficiently-great tries were culled from the list, out of the grand total of 11 scored in the first seven Rugby World Cup finals. Four were scored in the 1987 final, then seven in the next six showpieces. At least four of those 11 tries have now been knocked out of the 11 Greatest Ever Rugby World Cup Final Tries. 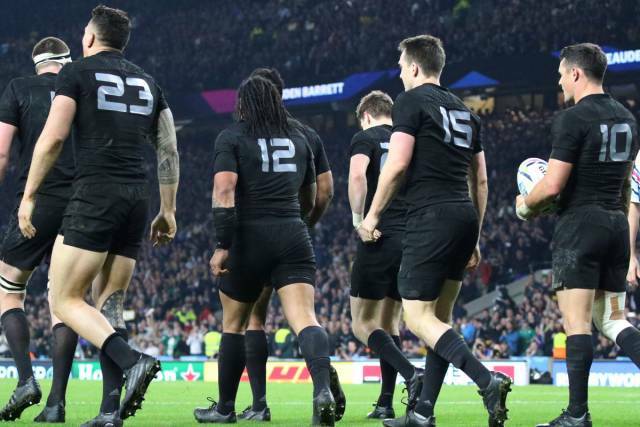 At least four of those 11 tries have now been knocked out of the 11 Greatest Ever Rugby World Cup Final Tries. Perhaps five, if you are a fan of well-executed mauls. The 2015 tournament, perhaps the first conclusive victory for attack over defence in Rugby World Cup history, a six-week extravaganza that might launch rugby into a braver new global future, had the captivating final it deserved and needed. 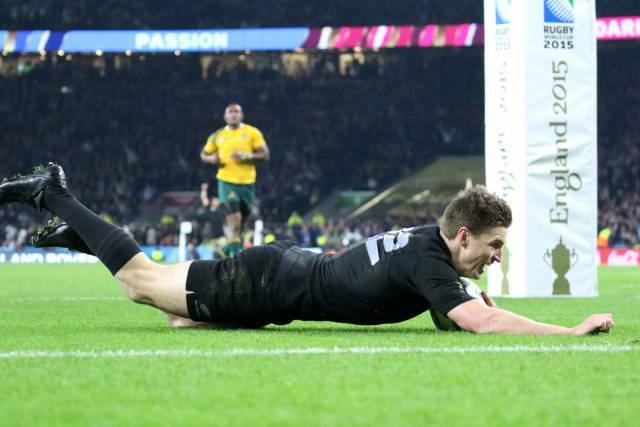 Beauden Barrett – New Zealand replacement dives over the line for a late try. The tournament was not perfect, and rugby should strive to improve in order to capitalise on this superb tournament. There were too many injustices, on and off the field, in terms of scheduling and, occasionally, officiating. Scrums have improved of late, but remain a time-draining irritation far too often. Goal kicks take too long. The maul is, to my admittedly inexpert mind, loaded in favour of the attacking team; at times it seems like the only legal method of stopping an eight-or-more-man-wodge rumbling towards your line with the ball buried invisibly somewhere about 120 stone of athlete away from where you’re allowed to be, is to sacrifice a bull to Zeus and hope for divine intervention. And hope that none of the blood splatters in front of the back foot of your side of the maul. From a ticket-buying fan’s perspective, the overall experience was largely magnificent. The ticket prices ranged from Absolute Bargain to Wallet-Meltingly Ridiculous (even excluding the odious secondary-ticket market, the apparently-legalised touting sites that leech unearned profits from the efforts and talents of others; at least genuine touts have the balls to fleece people face-to-face, whilst getting some much-needed fresh air). The atmosphere in the stadia was superb. Or at least, it was superb during the games, when it was permitted. In the half-hour before the matches, during half-times, and after full-times, the collective council of wisdom which decides such things had decided that the spontaneous noise and authentic atmosphere created by a sold-out crowd in a state of sport-induced excitement would be less enjoyable than a man shouting into a microphone and asking supporters in the crowd whether they hoped that the team they support would win. A Spectacle worth the asking price? Whilst I concede that, this being the 21st century, some shouting into microphones is now inevitable – I also hope that, at some point, sport will employ someone who understands sport to stage-manage the crowd at sporting events. Or not stage-manage them, which is, on most occasions, all the stage-management that is required. Saturday’s final also highlighted an issue World Rugby will have to address before Japan 2019. Sonny Bill Williams had already garlanded the final with two trademark high-impact offloads in the build-up to Nonu’s masterpiece, followed by another one-handed flip after the 80-minute mark when he could have booted the ball off to complete proceedings, a glorious moment of unnecessary virtuosity. Williams had not finished with concocting off-loads which other players would not even have considered possible, however, and promptly off-loaded his winner’s medal to a 14-year-old pitch invader. How will World Rugby deal with 80,000 people charging onto the pitch at full time on 2 November 2019, demanding their free gold medal. Given the prices of the tickets for the final, anyone with a seat within pitch-invading range would have felt justified in thinking that they ought to be going home with some solid gold as part of the deal. However, this has created a logistical precedent that will concern organisers will have to confront. How to deal with 80,000 people charging onto the pitch at full time on 2 November 2019, demanding their free gold medal. For the non-hakaing nations of the rugby world, the next four years will be dedicated to attempting to dethrone the champions. It is often said that the All Blacks “just do the simple things incredibly well”. This is undoubtedly true, particularly if you consider ‘simple things’ to include 25-yard miss-passes flung down the gain line, lighting side-steps in the midst of mayhem, one-handed offloads from a three-man tackle, 40-metre drop goals concocted from an indiscernible moment of time and space, turf-scorching 50-yard diagonal nimble-toed power-dripping twinkle-galumphs to the try line, and other moments of everyday humdrum simplicity displayed by New Zealand on Saturday. 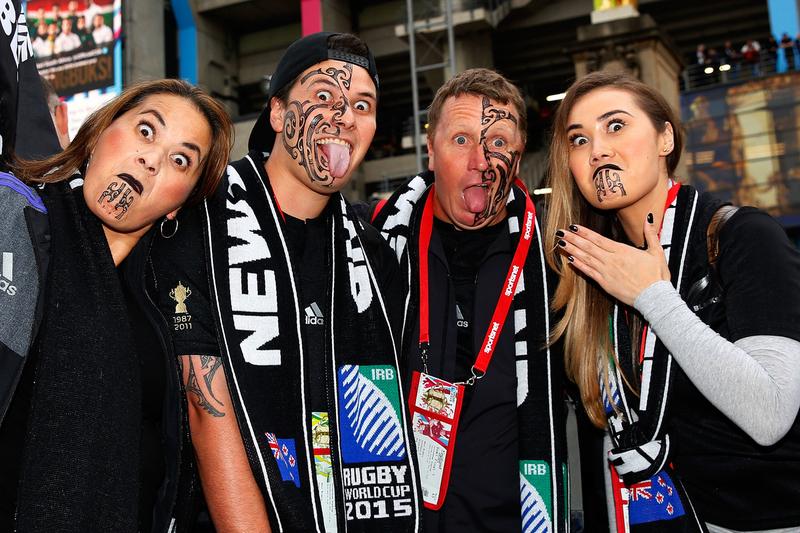 Perhaps it is truer to say that the All Blacks do the simple things incredibly well. And the complicated things incredibly well. When will we see your like again? They also negotiated moments of genuine peril in the final two matches of what may be presented in retrospect to have been an inevitable march to destiny. A final that had shaped to be a defining exhibition of dominance transformed into a four-point gut-clencher that, if it was not quite on a knife-edge, was certainly on the chopping board with a psychotic-looking chef looming over it with a gleaming Sabatier in hand. Australia were largely outplayed, but could have won it had a few of the numerous refereeing pivot points around which a rugby match swings had sent the game in their direction. Or they could have been thrashed, had the All Blacks played some moments differently. Even in the quarter-final against France, it was still level with just over 80 minutes remaining. A two-point lead offered the flimsiest of cushions as South Africa threw to a line-out close to the New Zealand line with a few minutes remaining of a taut, sodden semi-final. Even in the quarter-final against France, it was still level with just over 80 minutes remaining. If only 78 or 79 of those minutes had gone differently, who knows what could have happened? 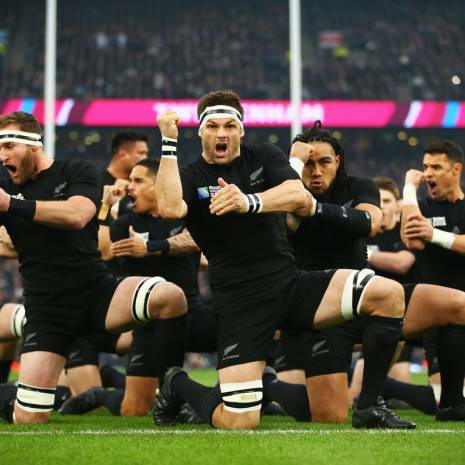 At the ultimately decisive moments, the All Blacks proved their greatness. They are glorious champions of rugby’s greatest ever contest. Andy Zaltzman, is a stand-up comedian, the British-based half of the international hit satirical podcast The Bugle, regular on 5 Live’s 7 Day Saturday, ESPNcricinfo contributor, and a man who prefers sport to reality. His own competitive rugby career ended at the age of 11 due to a combination of uselessness and cowardice.